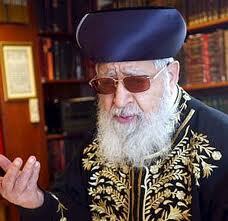 Rav Ovadiah Yosef, preeminent leader of Sephardic Jewry, died on October 7. This week, Rabbi Ovadiah Yosef died at the age of 93. He was a true giant among the Jewish people for his leadership and mastery of the art of p’sak halakhah, Jewish legal decision making. Rabbi Ovadiah Yosef was the preeminent voice and authority for Sephardic Jewry, Jews primarily from the Meditteranean rim and the Middle East. He served in the formal role as the Sephardic Chief Rabbi of Israel in the 1970s but remained the dominant Sephardic rabbinic authority in Israel and around the world throughout his life. As noted in various tributes, Rabbi Ovadiah Yosef was a bold, creative, and confident jurist, and often remarkably in touch with the sensibilities of a broad constituency, especially the oft-ignored working-class. He brought honor to Torah, to God, and to human beings, including many types of people whose voices were systematically silenced in Rabbinic discourse. For much of his career he was a voice of reason and compassion when much of the Orthodox world, particularly Ashkenazi Rabbinic leaders in Israel representing traditions from Eastern and Central Europe were promoting far more stringent paths of observance. Rabbi Ovadiah Yosef’s ruling that the Beta Yisrael community of Ethiopia were part of the Jewish people and did not require formal conversion to Judaism paved the way for Israel to bring tens of thousands of them to Israel. His voluminous responsa also show sensitivity to the economic plight of many of his constituents. While more prosperous Ashkenazic households were more prone to spend lots of money to keep a kosher kitchen, going so far as to purchase two dishwashers, he was more lenient. Religiously observant Sephardic women in Israel commonly wear pants, thanks to Rav Ovadiah, while Ashkenazi authorities long ago decreed women could only wear skirts. An even more noteworthy ruling favorable towards women was one he wrote after the 1973 Yom Kippur War. He allowed hundreds of women whose husbands were missing in the war to remarry, although, traditionally, remarriage is allowed only after a woman has received a “get,” a religious bill of divorce from her former husband or there is incontrovertible proof that her former husband has died. The plight of the Agunah, a woman chained to a defunct marriage, continues to be a vexing problem in much of the Jewish world today, largely because of the lack of courage and vision among rabbinic authorities. Rav Ovadiah stood up boldly to free women from this state. In the euphoric years after 1967 War, many Ashkenazi religious Zionists were filled with messianic zeal for the prospect of settling the newly occupied territories. R. Ovadiah Yosef, however, ruled that it was permissible to exchange land for peace. He was a bold, creative rabbinic thinker and leader, and he should be praised as such. The story of R. Ovadiah Yosef doesn’t end there, though. He was a complex personality. Who was the real Rabbi Ovadiah Yosef? The answer is they were both one and the same person. He was a complex individual. It shouldn’t come as a surprise to us that he had such a multi-faceted personality. We need only turn to today’s Torah portion, Lekh Lekha, to meet another complex hero of the Jewish people, our patriarch Abraham. Immediately upon settling in Canaan as God had instructed, Abraham uproots himself and brings his household to Egypt. The text says vayered Avram Mitzraymah, Abram went down to Egypt, suggesting that he lowered himself to the moral level of that society. What happens next is particularly disturbing. Abraham is afraid that the Egyptians will kill him and take his wife Sarai and ravage her. What does he do? He says that Sarah is his sister. She would be vulnerable to being kidnapped and assaulted, but at least he would live. This is not a shining moment of chivalry in the life of our patriarch. Clearly, in this environment of danger and depravity, we can understand Abraham’s fear that led him to deceive others to save himself. While we can understand his fear, we cannot justify his actions, and that is the Torah’s point. As Rabbi Harold Kushner writes, the Torah continually portrays its leading figures with all of their flaws, perhaps to teach us that we too can be good people without being perfect people. Look throughout the Bible and we find one hero after another, each of whom we meet as flawed human beings. These include Jacob, Moses, and King David. Looking at American history, we find that many of America’s most outstanding leaders and statesmen often displayed deep contradictions. Thomas Jefferson wrote in the Declaration of Independence, “We hold these truths to be self- evident that all men are created equal.” Yet, for several more decades he continued to own slaves. President Roosevelt was hailed for guiding the nation out of the Depression and for his moral clarity in leading the nation in war against fascism in Europe and Japan. Yet, history has shown that when he had the knowledge of the plight of European Jewry and the power to save them from slaughter, he failed to exercise that power. Dr. Martin Luther King, Jr. led the Civil Rights movement, while at the same time he consistently cheated on his wife. The Torah was not given to angels. It was given to human beings with the intention that we would be inspired by its teachings to improve ourselves and our world. The major characters of the Torah are flawed human beings who, despite their limitations, or perhaps because of them, are able to succeed despite their natural human fears and desires. We can and should condemn individual acts of behavior that get in the way of bringing godliness into the world. At the same time, let us pause to appreciate great contributions to society. Rav Ovadiah Yosef was a complex human being who was a once-in-a-generation scholar. Israel and the Jewish world, on balance, were enriched by his immense contributions. May his memory be for a blessing. He was, indeed, a complex individual and while I can see he made some bold decisions and had some worthy goals, I still think he exemplifies (among others) why religion and politics don’t mix. Also, I find it hard to get past his many despicable comments about non-Jews and secular Jews.